Welcome to my PDF Printables Section. Below you will find the PDF files I offer for sale. There will be a link below each for purchase. If you are purchasing a PDF that can be personalized please remember to put that information in the comment section to me when you pay via Pay Pal. I will send the PDF file or download link to your email on file with PayPal. If you do not receive it within 48 hours please let me know. I will personalize them with your name (or business name) and I can change them to say Knitted for you by: or Crocheted for you by: instead of Handmade for you by: at request. Each set has pre-printed lines at each end to help you when you cut them so that each is perfectly sized. You just print on any color paper 8 1/2″ x 11″, cut and wrap! A small piece of scotch tape holds it together. 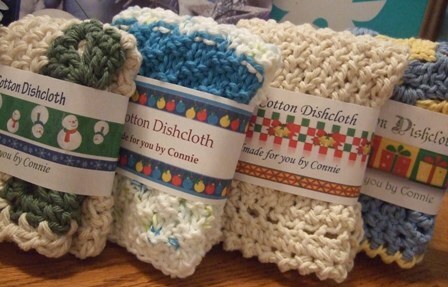 If you sell your dishcloths, you’ll also want to slip a business card in the back of each one. You’ll receive the PDF set by email and may print them out on any paper you choose and as many times as you need. These make any dishcloth gift so much nicer and if you sell your dishcloths online these will make them stand out from the rest. You can print these out and wrap your dishcloths for sale online. 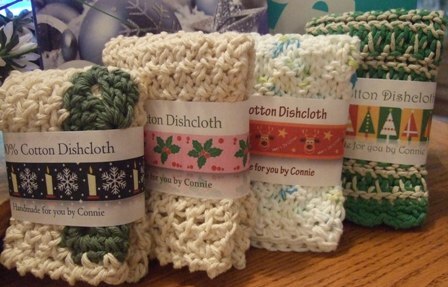 You can wrap them individually or fold the dishcloths in sets of 2 or 3 and then wrap them with the wrappers. 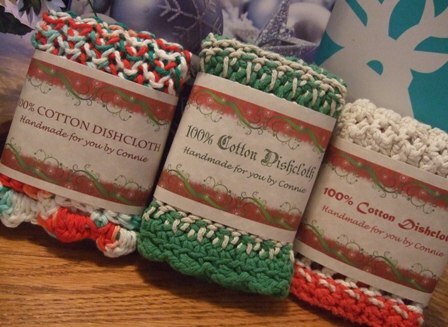 These make a dishcloth gift even nicer! You can purchase these sets and see all of my other sets HERE! Wide Sheep Set – 1 design that will print 3 per page. Purchase your Make the Cut program and never purchase another Cricut cartridge…EVER! Click the logo above to purchase now or to download a FREE completely functional demo copy of the MTC software click here! Demo copy will work just like the purchased version, but it will cut a diagonal line through your project! Get more info at my scrapin’ blog… Cut by Connie! I would like to purchase the discloth pattern and also some covers. I would like to send a money order or check for the purchase. Can I do that? Also what type paper do you print he wrappers on? I love your wrappers, I have bought some from you and have had compliments on them when I gave them as gifts wrapped around the dishcloths. Hi Elayne, I’m so happy to hear that you are using them and that people are liking them. I think they do add a little extra something to a dishcloth gift! Thank you for stopping by and for commenting!